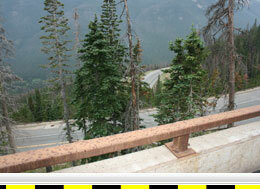 Berthoud Pass is a high mountain pass in the Colorado Rockies along the Continental Divide. Berthoud Summit is located on U.S. Highway 40, near Winter Park, Colorado. U.S. Highway 40 is the northern route across the state of Colorado, and connects Interstate 70 to Salt Lake City, Utah. 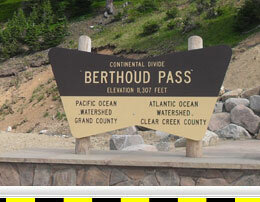 The summit of Berthoud Pass is over 11,000 feet in elevation. It receives a large amount of snow in the winter, and often either has chain restrictions for commercial trucks or is closed for avalanche control. Highway 40 on both sides of Berthoud Summit is a classic steep, winding, mountain shelf road with an average grade of about 4.5%. Although Berthoud Pass is not as steep as some of the other Colorado Passes, it is most notable for having a lot of low speed switchbacks. The combination of the 4.5% grade and many 15 to 20 mph switchbacks makes it a dangerous traverse. Berthoud Pass is commonly used for back-country car-shuttle skiing, so skiers are commonly encountered on the pass road, hitchhiking or waiting for a ride back to the summit. Westbound U.S. 40 from the Berthoud Summit has a vertical descent of 1652 feet over a distance of 7 miles. The westbound descent has numerous marked advisory curves. The lowest advisory speed curves are 20 mph and there are four of these on the westbound side. The highway straightens out around the 236 milepost or about 7 miles from the summit, but there is a continued rolling descent for about another 6 miles. Winter Park/Mary Jane Ski Area is located approximately 8 to 11 miles west of the summit. The ski area has numerous parking areas on both sides of the road and there are stoplights at 10.0 and 10.7 miles from the summit. 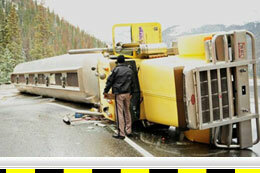 Traffic should be expected at these locations, particularly in the morning and afternoon during the ski season. Eastbound U.S. 40 from the Berthoud Summit has a vertical descent of 1664 feet over a distance of 7 miles. There are numerous curves signed with advisory speeds. 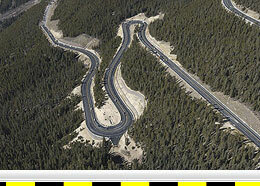 The lowest advisory speed curve is 15 mph at 3.6 miles east of the summit. Another curve signed for 20 mph at 1.5 miles east of the summit has both the sign and curve hidden behind a rock wall. Additionally, the 20-mph signed advisory curve at 5.6 miles has two additional advanced warning signs. These signs are at 4.4 and 5.2 miles east of the summit and warn of the 20-mph curve in one mile and one half mile, respectively. The presence of these signs is indicative of the curve at 5.6 miles being problematic, so be careful. A highway department maintenance facility is located about 6.1 miles from the summit, where highway maintenance trucks entering and leaving the driveway should be expected. The highway straightens out near the town of Berthoud Falls at about the 249 milepost but has a continued rolling descent for about 7 miles to the town of Empire. Between Berthoud Falls and Empire, there is a 5% to 5.5%, 2.5-mile grade section starting around the 252 milepost.